Thanks to Werner Bloos there is a German version of SDMdng, see here. 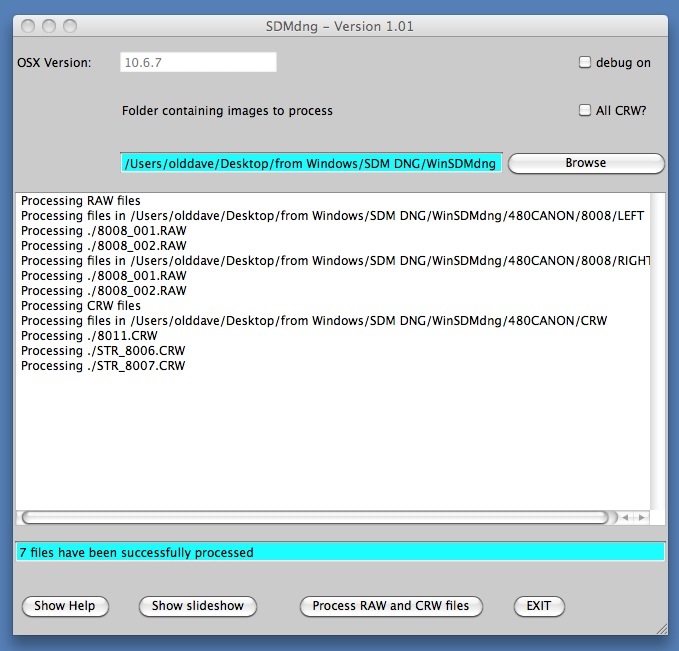 On this page you will find OSX and Windows tools to deal with RAW images produced by SDM (Version 1.85 and later). With SDM, RAW images are always saved with a separate DNG header file. This file contains minimal information concerning the image and no thumbnail. By this means, the fastest shooting speed is obtained (although high-speed cards are recommended). SDM will also save a pair of image-strips of defined width, equally spaced about the image centre and normally with the camera vertically orientated. This allows the creation of very large stereo, 360 degree panoramas of static subjects using a single camera rotating in front of a central point. Further details are to be found here. A folder containing a mixture of these three types of RAW image may be processed and displayed on a Mac or Windows machine by running a simple Java app which does all the work. The screenshot below shows the app running under OSX (the Windows version looks very similar). Click on any field to get help about it. Note that the four files must be in the same folder. To run the app, just double click the SDMdng icon. When the app has finished converting the raw files to DNG form, Preview will be invoked to display them. Note that the four files must be in the same folder. To run the app, just double click the sdmdng.jar file. If this doesn't work (e.g it starts up Nokia OVI) then double-click the runsdmdng.bat file instead. As written, the jar expects to find irfanview (used to display the slideshow) in the "C:\Program Files\irfanview" directory. If it is located anywhere else, edit the sdmdng.properties file (using Notepad) and amend the "ifpath=..." line to point to the correct directory. Comments, suggestions and bug reports welcome. Dave@zenoshrdlu.com. All my apps are freeware, but if you've found them useful and would like to thank the author, you can make a donation (for example £1, €1 or $1) to show your appreciation for the many hours spent working on them!